How I wanted to spend today might be a bit different from what other moms did today. But it was an AWESOME day and I did exactly what I wanted to. and it was a bit cold but the girls still has a blast! I tackled a patch of stinging nettles that will hopefully be our pumpkin patch! The grass got cut! And I didn't have to do it! I weeded the strawberry bed and admired the beautiful blooms that have suddenly appeared. And we planted a tree! Well, transplanted it really. This small maple tree was in a different part of our yard, being choked out by a larger bush so we decided to try and move it to save it. I don't know if it will make it because we couldn't get a lot of roots, but we will see. If this one doesn't make it we have decided we will buy a small tree to put in this spot. We need a bit more shade in our yard and are hoping that we can save this small tree tree and not have to buy one, but we will see. We ended the day with a great dinner, reading time and cuddles. It was a great outdoor day full of productivity, fun and laughter. What could be better than that? Just a reminder that the Earth Day Celebrations Blog Hop is going on! Be sure to scroll down and check out some of the great ideas that are being shared. Here are a few of my favorites that have been shared so far! Check these out, leave them a comment to let them know Greening Sam and Avery sent you, and then come back and link up a post of your own! So, now onto another great way you could celebrate Earth Day! It isn't tree planting time yet in our area, still too many days of frost and no leaves on the trees. But we are gearing up for planting season with some tree planting books. 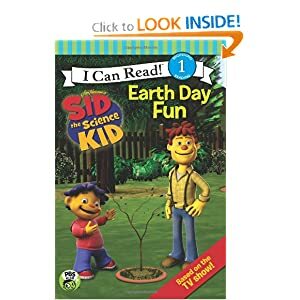 Sid the Science Kid is a great science based show that my kids love and last year after Earth Day I found this book. There is a ton of great information about dirt in there, presented in a way that little ones can understand. Plus the activities that the kids do in school, in the book, are really neat and ones that I would like to try when the girls are a bit older! 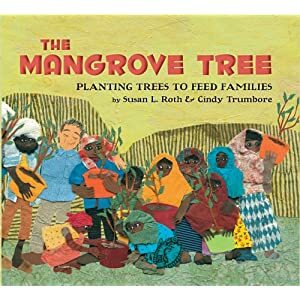 The Mangrove Tree by Susan L. Roth and Cindy Trumbore is a style of book that I just love! They have bigger text at the top of each page that is rhyming, tells the story and presents the story in a way that is appropriate for young kids. But then along the sides of the pages there is more information about the trees, the people and the real story. I love that a parent could get this book and read have it work for both a younger child and an older child! If you need more ideas for nature related books to read on Earth Day head over to Must See Children's Books for LOTS of great ideas. Let's get this celebration started!! Earth Day is just 12 days away and I want to pack in as much play, learning, crafting and celebrating the Earth as I can! We got started today with a craft project with our friends. It was a super simple project today and just filled a few minutes of our outdoor play time and then a few minutes inside while the moms made dinner but there is a ton of variations, expansions, etc. that could be done with this basic idea. The kids started with some bare trees drawn on a piece of paper. I asked the kids what was missing and then we headed out to collect some items they could use to create the branches, flowers, seeds and leaves that the trees needed. For the two 2 year olds I did the gluing for them. And then they just added whatever materials they wanted. For the three 4 year olds I let them do all the work themselves. They turned out pretty cute and if the kids were not excited to move onto other playing and activities they probably would have spent a lot more time on this. You could take this idea and create any kind of natural image or animal and then have your child decorate it with natural items they found. Outside time collecting small items from nature and then using them for a craft project that your child can keep are great ways to celebrate Earth day! It gets your kids close to nature, noticing small fun items and the creating something to help them remember their time outside. Do this activity with a group of friends and it can become a real party! Ready to share some of your ideas for how to celebrate Earth Day? I am super excited to hear what you all will be up to with your little ones this month. If you are in need of ideas you can check out my first earth day celebrations post or head over to my co-host's blog, Mommy Labs. Be sure to link up posts that relate to Earth Day! We want to hear about your crafts, books, outdoor play or learning, service projects or anything else that you have cooked up to help your kids connect to the Earth on April 22nd. If you grab the button or share the link for the blog hop I will help spread the word about your post via Facebook, Twitter and/or Pinterest! So once again this poor blog is taking a back seat to real life. My husband surprised me today with a visit from my two best friends from college. I was floored when the first one walked in with Chris at noon and then completely blown away when the other one showed up tonight around 7:30pm. It is amazing to see them and I cannot wait to spend the weekend catching up and just laughing like we use to! But today we did squeeze in a few moments in the backyard for Sam to show off her new love of tree climbing to my friend Tracy. I feel like tree climbing has become kind of an old fashioned thing and you might hear people say things like "kids don't really do that anymore" or "it's just too dangerous now". And while I do understand and appreciate the danger that is involved I also am a huge fan of the activity and hope my girls will continue to want to climb trees for many years! With the right supervision, strict guidelines and appropriate level of understanding it can be a really wonderful learning experience and great outdoor fun. Let mom/dad know when you are climbing down so they can move your younger siblings who are inevitably in the way and bound to have their head stepped on! Be brave with your child. Let them explore trees in a new and unique way. If you have a good tree climbing tree in your yard or near by in the neighborhood lay out very clear ground rules but then don't be afraid to let them be kids and have fun. When you get a heat wave in October in WI that raises the temps to almost 80 degrees you do not let it go to waste! The girls and I spent as much time outside today as we could. As soon as the girls woke up from naps I got them in some mud play clothes and we headed out to the backyard. I already had their buckets and watering cans filled with water and the mud kitchen open for cooking! They were thrilled. And after about an hour they were covered from head to toe in mud! Then we moved onto the swings, slide and general swingset craziness. Lastly we did some tree climbing! I have once again cleaned up an area at the far end of our backyard so that Sam and Avery can play in and around some big evergreen trees. Sam has seen her cousins climbing trees and when she noticed the big low hanging limbs she decided to give it a try. I helped her at the beginning and we talked about the tree climbing rules (you can only climb when mom is right here with you, we only climb next to the trunk of the tree, we always looks for the biggest branches to put our feet on, when mom says high enough you do not go any higher) and then I let her experiment with where she could around the tree and how high she could go (which was only about four feet off the ground). She did great and loved it! Avery was so cute standing on the ground underneath her, she was so concerned and confused by what Sam was doing. We ate ice cream on our front stoop tonight and then went for a long family walk! It was a great day and if what the weather man says will happen stays true we will have several more great outdoor play days like today! Sorry no pictures from today. As a blogger I sometimes feel obligated to bring my camera with me everywhere. But then I catch myself focusing too much on getting the perfect picture, capturing every moment and getting enough photos that I miss out on actually playing with my girls. So today I made the conscious decision to leave the camera on the table. I wanted to be in the moment with the girls and not just an observer. I wanted them to see fun mom and not just the mom that makes them look up and smile! I know it makes for a much more boring post but it makes for a more fun afternoon and in the end that is what it is all about for me! Wanted to share some more great ideas about nature journaling. Here are some of my favorite activities. I have not done all of these with Sam and Avery yet and many of them would be too advanced for them; these activities are mostly for slightly older kids and can be used all the way up through adults. I have however done all of these activities with groups of kids in non-formal environmental education settings. They have been some of my favorites that work great with kids and really help them take a closer look at the natural world around them. Lots of kids like to collect things on the trail. This activity simply gives them a way to capture their treasure without actually having to take it home. Give the children some time out on the trail to find something that they think is a "treasure". Then have them sit and draw their treasure as well as they can. The drawings don't have to be perfect just a picture that will help them remember the great thing they found out on the trail that day. The children can then share their drawings and talk about what made that item so special. Take your child/ren to a natural area and give them some boundaries for where they can go exploring. Allow them some freedom to explore off trail (if it is safe) and on their own (if they are the appropriate age). While they are out exploring their job is to find what they think is the perfect spot. It could be alongside a creek, at the top of a hill, at the bottom of a neat tree, up in a tree, next to an animal home, etc. but each child must find their own spot. Once they have found their spot encourage the child to draw the spot and answer through their drawing or words some questions about the spot; what do they see? what do they hear? what do they smell? what other living things are they sharing the spot with? what other living things may have been there in the past? what makes this spot a perfect spot? While out on a trail pick a spot to stop that has some open area for the child/ren to explore. Have them each find something non-living that they can fit inside the palm of their hand. When they close their hand they should not be able to see any part of the item. Then have them sit down and carefully draw that item. Ask them detailed questions about the item while they are drawing, encouraging them to look closer and closer. When they are done with their drawing be sure to have them return the item to where they found it. Sit down a quiet natural area with your child/ren. Have them place a large x on the center of a piece of paper. That x represents themselves. As they sit their quietly have them place additional symbols (can be any shape, size, color, etc.) on their page that represent the sounds they hear around them. Encourage them to listen very closely and see how many different sounds they can "draw" on their paper. Each sound should have its own unique symbol. After a few mins (determine length by the age of the child/ren and their interest in the activity) have them share their drawings and talk about the sounds they heard. This activity is all about imagination and may require slightly older kids/students. Pick a large tree in a natural area and talk about who/what might be living/using that tree (birds, squirrels, bugs, moss, animals/people for shade, etc.). Talk about what the tree might look like to each of those things; what does a tree look like if you are a bird flying above it? what does a tree look like if you are a squirrel sitting on a branch in the middle of the tree? what does a tree look like if you are a bug crawling on the bark? what does a tree look like if you are a kid sitting underneath it? etc. Then have them try to draw the tree as it would look from those different views. Want more natural journaling information? Here are some online resources that might be helpful. Keeping a Nature Journal - this is an overall great resource and has great information about why we should be journaling outdoors with our kids. Starting a Nature Journal - great example of a family doing journaling with little ones; also has links to some great journaling books. Preschool Pre-Reading Journaling Activities - some good ideas for little ones to do outside in their journal. Nature Journal -Getting Started - a great way to get started with links for helpful info and printouts.